The disappearance of a young Cree woman in Toronto traumatizes her Northern Ontario family, and sends her twin sister on a journey south to find her. THROUGH BLACK SPRUCE has one scene where a character walks through wooded black spruce. There is something subtle about the scene though one can not be 100% clear what the meaning of it all is. The same thing can be said overall of Canadian actor/director Don McKellar’s (LAST NIGHT) mesh of missing persons mystery and indigenous people statement. The film is an ambitious and diligent work but the two genres fit uncomfortably in a somewhat drab thriller, not for want of trying. There are two things going for McKellar’s movie. The first is the beautiful and stunning Ontario landscape of James Bay. The shots of the lakes, forests and vegetation are typical of the beast scenery Ontario, Canada has to offer. The second is the impressive performances of the film’s indigenous cast. Veteran Graham Greene returns as well as the Toronto Film Critic’s Association’s darling (they recently honoured her), Tantoo Cardinal as well as Brandon Oakes. New is Tanaya Beatty in the title role of Cree woman Annie Bird. The film is bookended by the violent beating of Annie’s Uncle, Uncle Will (Oakes) of a golf club by the local drug dealer. The golf club is one of the most awful weapons used in film – the last time it was used was when Randy Quiard took out Sandy Dennis, the school councillor in PARENTS. The story of what happens in between is the movie. Suzanne, Annie’s sister has gone missing after chasing her modelling career in Toronto. The subplot emphasizes Canada’s major problem of missing indigenous women. 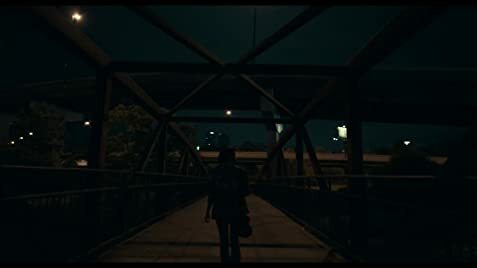 Annie stays in Toronto hunting for clues for her missing sister. She learns of her sister’s drug habits including some shady dealings with ex-drug dealer boyfriend Gus. In the mean time, she has a mild romantic fling with her sister’s last photographer, the fast-rising Jesse (Kiowa Gordon) before thing with the sister started falling apart. In the mean time, Uncle Will takes off on his plane despite not having a void pilot’s license for a decade up north into hunting territory for reason revealed at the end of the film. These segments are interspersed with Annie’s mis-adventures in Toronto. The two segments do not flow well, and the dramatic effects of each are lost when the segments change. Thankfully, all makes sense at he film’s climax when all is explained. Despite the film’s flaws, credit must be given to McKellar for mounting such an ambitious indigenous film. The hunting scenes especially the ones with the grizzly bear and the moose’s carcass bring authenticity into the story. The Toronto famed scenes are also well done. McKellar seems fond of Toronto’s Queen Street where streetcars frequent (as observed by an overturned streetcar in LAST NIGHT). The club scene with the throbbing vibes whee Annie gets totally stoned look chic and trendy. 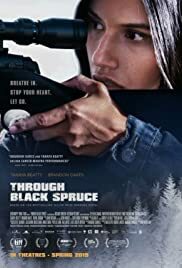 Not a total miss and not without its intrinsic pleasures, THROUGH BLACK SPRUCE is an entertaining mystery while shedding a little isight on the troubles of the indigenous people of Canada. Mina Shum directs an all-star cast — including Cheng Pei Pei, Sandra Oh, Tzi Ma, and Don McKellar — in her latest feature, about a devoted wife and mother (Pei Pei) who is forced to reassess her reverence for her husband after she finds another woman’s thong in his laundry. Hong Kong martial-arts superstar Cheng Pei Pei, now in her ageing years stars as Maria, a devoted wife and mother who is forced to reassess her reverence for her husband after she finds another woman’s thong in his laundry. She discovers that her supposedly devout husband, Bing (Tzi Ma) is not the perfect husband she thought him to be. They are visited by their daughter (Sandra Oh) who wishes her mother attend the brother’s wedding. The brother has been disowned by Bing. Maria starts tailing her husband to find out more of his affair. At the same time, Maria opens up her life and finds companionship through her assortment of friends as well as though a neighbour (Don McKellar). She finds that life has more to offer than just tending to her husband, and to one who has been unfaithful at that. There are some magnificent performances on display here, Cheng Pei Pei’s being the most obvious. Sandra Oh, who has been in Shun’s films in the past is always good and a pleasure to watch. Shun does not compromise her film for the typical Hollywood ending. 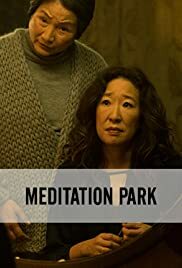 EDITATION PARK should be seen for it being Shun’s best work and for Cheng Pei Pei’s controlled yet powerful performance. Tortured by the memory of a childhood trauma, a woman returns after a decade to her family’s fly-in hunting lodge to assist her siblings with their dying father, only to find herself stuck in a life threatening nightmare. The change of title from THE HIVE to BLOOD HONEY is a wise decision since there are already too many films that come up when googled under the film title THE HIVE. But THE HIVE also explains the ‘apparent’ closeness of the protagonist family in a remote northern fly cabin, but one that is forced rather than nurtured. The word gripping can be used to describe the film as gripping is the emotion felt strongly in just 15 minutes of the film. A lot happens within the opening credits as well – a suicide, a girl’s growing up into a woman and the displayed sibling affection. The audience is set up for a Canadian film in which boring should not come into mind. Tortured by the memory of a childhood trauma which is the witnessing of her mother’s suicide described in the earlier paragraph, a woman , Jenibel (Shenae Grimes-Beech) returns after a decade to her family’s fly-in hunting lodge to assist her siblings with their dying father, only to find herself stuck in a life threatening nightmare, where she must struggle to survive. She obviously blames her father for her mother’s suicide and has managed to forgive her father prior to her visit. But her father proves more than she expected. (She intends to forgive him but her father does not intend to be forgiven). At the same time, he makes her promise not to sell the lodge or the land. But her family feels otherwise. Bees come into the picture when the dying father commits a grand exit from life by being stung to death by the bees. Director and co-writer Kopas (with Doug Taylor of SPLICE, a film I hated) says that his film is influenced by by classic old school thrillers such as Rosemary’s Baby, Vertigo, The Shining, and Jacob’s Ladder. This might be true but the film never reaches those heights or even remotely close, as these are high standards. There are a few good elements in the story, like the woman discovering she is slowly being poisoned. The film lags in the middle when the woman is unclear what is happening, and the film relies on too may flashbacks and false alarms. The script also never makes it clear the reason the father behaves in such a way causing the wife to commit suicide. His erratic behaviour is assumed to be caused by his guilt. The woman’s final escape also leaves too many credibility gaps.